R.R. Ryan, author of such ominously sounding titles as Death of a Sadist, Freak Museum and The Subjugated Beast, has attained a cult status on the strength of his violent visions alone. But who was he, or she? I had the honour of co-writing with James Doig the article 'Finding R.R. Ryan' on the identity of that mysterious British horror writer of the 1930's, R.R. Ryan in All Hallows: The Journal of the Ghost Story Society issue 37, 2004. At that time it was only known that the writer's name was a penname, but for whom? James finally solved that riddle and published his research results as 'R.R. Ryan Found', in All Hallows: The Journal of the Ghost Story Society issue 44 in 2008. James and I earned a small spot in Joshi's Supernatural Literature Of The World, An Encyclopedia with our first article. The honours in having solved the riddle that had led to much speculation, belong entirely to James. But here's the fun part: there's a new and interesting website on R.R. Ryan that certainly merits a visit. 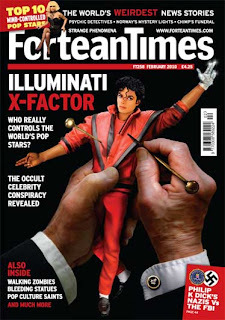 I am sure some of you know the venerable Fortean Times, which is, as it states, "the monthly magazine of news, reviews and research on strange phenomena and experiences, curiosities, prodigies and portents. It was founded by Bob Rickard in 1973 to continue the work of Charles Fort (1874 - 1932)." I have a regular column in there entitled 'Blasts From The Past', where I share some of my research into the strange things that emerge when delving into the 19th and 20th century digital newspaper archives. One of my lines of research involves the Victorian bogeyman Spring-heeled Jack, and my contribution will appear in a study under the editorship of Mike Dash later this year. James Doig, who also blogs here, was so kind as to alert me to what I have termed the Bendigo Spring-heeled Jack. This involved a ghost scare set in 19th century Bendigo, Australia and written about by none other than J.P. Quaine in 1939. I did some research and published the preliminary results in my column in issue 258 of Fortean Times which is currently on the newsstands. Since I also used quotes from materials posted here by James, I referenced these quotes, pointing to Wormwoodiana. It's nice to see that there's no distinction between online and offline scholarship. These digital times certainly enhance the abilities of any researcher to delve even deeper into a topic or subject. I'll keep this item brief: in 1917, the Brooklyn Daily Eagle, a newspaper out of Brooklyn, New York, published a review of Algernon Blackwood's The Wave, An Egyptian Aftermath. The reviewer concluded: "Anyone who has read Julius Le Vallon, John Silence, Ten Minute Stories, etc., by the same author, will be pleased to read The Wave, which is quite as good in its way as any of its predecessors." Ursual K. Le Guin and the "Google Settlement"
Just a quick post here to call attention to Ursula K. Le Guin's commendable public stance against the "Google Settlement" which disregards the copyrights of writers and editors. Her comments are available here. Thanks to the internet, we can now share what we have managed to preserve of the unique art that adorned the dust wrappers of the 1920's - 1930's horror and supernatural books. In most cases these covers are but rarely seen, as dust wrappers from that period, gracing books that were not even considered decent literature or collectible, are much rarer than one would think. There are some excellent sites doing their best in preserving, documenting and generously sharing the art of these dust wrappers. There is, for instance, the section on rare books on Robert Weinberg's site with a choice selection, there is the excellent supernatural fiction database of Tartarus Press, and there is the art gallery on Jessica Amanda Salmonson's website Violet Books. Today I stumbled upon the blog Grueseome Cargoes that is an absolute must if like me, you want to actually see what those covers look like and immerse yourself in that unique flavour of that particular era (yes, I like to watch the Hercule Poirot tv adaptations as they so graceously permit me to savour something of the style and social conventions of that pre-world war II period). And since in my case many books that I have collected over the years lack these spellbinding dust wrappers, it is a feast for the eyes and quite an aha-erlebnis. Gruesome Cargoes is meant, as its mission statement reads, and I quote, to be a "celebration of Christine Campbell Thomson’s Not At Night Anthologies (1925 – 1936)... 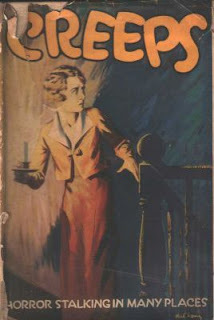 Gruesome Cargoes is also a celebration of Charles Lloyd Birkin’s Creeps series (1932 -1936)... similar obsessions to the above but with added unhealthy cannibalism and leprosy fixations." Recommended! Now we can only dream of the day where we can actually buy or print, through the net, these covers in full colour high resolutions, to restore those books that we have that lack their jackets. It is already common practice, so let's hope that some enterprising collector starts such an undertaking one of these days... or should I say, nights? One of the masters of the British supernatural tradition, Montague Rhodes James, needs no further introduction. 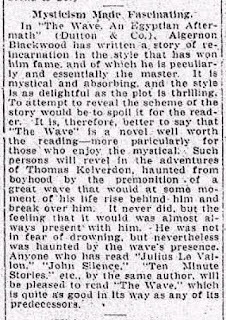 I was pleasantly surprised when I stumbled across the following review of 'a new set of ghost stories' in a 1920 American newspaper when searching for some local ghost stories. So, here's the review and in true Jamesion vein, the reviewer has done his (or her) best to suggest rather than to fully expose, some of the most horrible scenes in James's oeuvre. The review appeared in the May 30, 1920 edition of the Kansas City Star, published in Kansas City, Missouri. It was a reprint of a review that had been published in the Living Age, as the review indicates. The literary idler's life has its frustrations as well as its pleasures. One of my frustrations has been the life and work of Leslie Barringer (1895-1968). 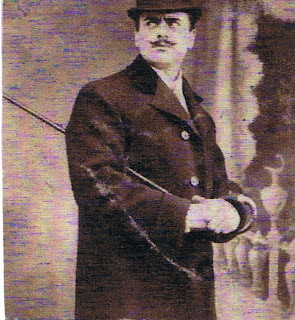 He was the author of three juvenile historical novels: but also, more to the point, a fine, loosely-linked trilogy of adult historical romances, set in Neustria, an imagined medieval kingdom of Northern France. These consist of Gerfalcon (1927); Joris of the Rock (1928); and Shy Leopardess (1948). I recommend them: they are compelling reading, far removed from the "godwottery" school, often bleak as well as vivid, and with many elements of the strange and sinister. They typically tell the story of an heir's ascent through adversity to a sort of triumph, in which there is also tragedy. But they are not simplistic nor moralistic; events and characters are complex and unpredictable. Leslie Barringer has had little attention. L. Sprague de Camp mentions him, I think; Robert Reginald wrote a fine essay on him ('Merovingian Dreams: The Neustrian Fantasies of Leslie Barringer', 1983); and there were paperback reprints of his trilogy in the USA in the Seventies. Barringer came from near to that part of Yorkshire where I now live. He retired to, and died in, the spa town of Ilkley, with its famous moor: and when I lived in or near there, I tried to find out more about him. The library and local history society had nothing; and two appeals in local newspapers yielded only a single contact. A caller left a message to say Barringer was a distant relative; she believed there was an unpublished novel in manuscript; but she thought there was no real interest in him. No contact details were left, and I never heard anything further. The internet, however, can sometimes spark new contacts or connexions. I hope so, for Leslie Barringer's books deserve better recognition.